Learn the right way to store and stash your beauty essentials. If you’re not going to edit your gargantuan beauty product stash, you can at least organize it, right? If you’re a beauty buff, you know the struggle of keeping track of pretty paraphernalia is real. But how do you streamline your collection? We’ve got you covered: Here are some gorgeous catch-alls and organizers to help you narrow down your essentials, all while displaying them in the most stunning way possible. 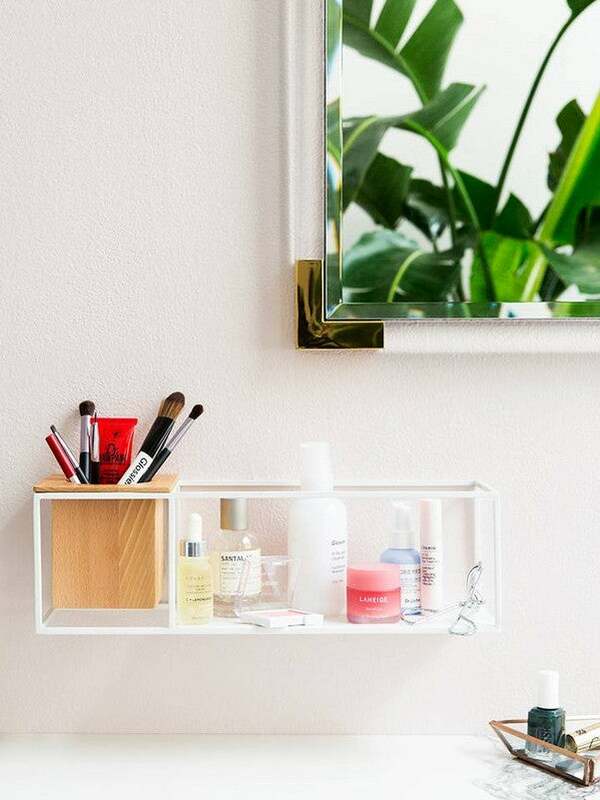 From lucite lipstick organizers to over-the-door storage racks, they’ll cover your every decor need (and then some!). And bonus round: you can even DIY your own pretty epic open-shelving organizer. Tight on space but heavy on beauty products? Consider the ultimate space saver with an over-the-door storage rack, especially when it’s as attractive as this version. This is great for storing products loved but not used everyday, like bath salts (unless you take a bath everyday and to you I say, “jealous!”) and facial steams. In classic Hay brilliance, they have practically redesigned the everyday tray, adding a dose of creativity and imagination into this stackable, mix-and-match version. Allow the endless geometric trays to inspire you with creativity in both your makeup organization and makeup application. Aqua blue eyeliner to match your aqua blue tray? Why not. Color your world and vanity. Makeup clutter got you feeling down? This beyond perfect drawer set was basically made for makeup organization. The attractive, clear drawers make it easy to see what you have and quickly grab what’s needed. Ring the alarm: Ikea has done it again. This item makes in-drawer organization a breeze. One half of the compartments are at a 45 degree angle, making usually hard to find items quick to grab, like those makeup brushes you love. Lipsticks always seem to be on the run and hard to locate? No longer, with the second half of the compartments allowing narrow items to stand on their own, like lipsticks, blushes, and concealers. Looks like Ikea just hacked your makeup drawer. A one-stop prep station, this Umbra-designed organizer is brilliant at space and time saving. No more running around a room looking for things, it’s all here, just waiting for you. A mirror? Yep, it’s here, and it can be taken off the stand to get a closer look at yourself too. Trays for perfectly holding your basics that are anything but basic? Yep, right here, and even a little rubber insert so things don’t move around on you. Skincare bottles looking a bit cluttered? This plate is perfection for arranging and displaying all your face oils, lotions, and creams, while keeping it maintained and organized. And Carrara white marble? Yes please, only the best for you and your luxe beauty products, my dear. You can also use the tray to display your favorite nail polishes and removers. Some nail polish bottles are art in themselves, crying out to be displayed. This set is fantastic for those who need to make the most out of a vertical space. Use this piece to hold jewelry, makeup, or even fragrances. An added bonus? The UV-resistant material stops the yellowing of the acrylic. And for all you powder buffs, it’s also simple enough to keep clean with a little soapy water. No matter where it lives in your home, this gilded glass piece will add an element of opulence. The organizer boasts six compartments for lipsticks, hand creams, or even the skincare stash that lives in your bathroom. This story was originally published October 28, 2017. It has been updated with new information.